A piece of wool weave. 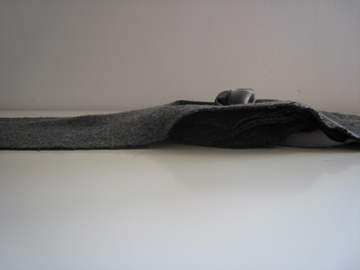 A piece of wool cashmere. A piece of 3dimensional sculpture, sewn. A piece of tactile - rough, smooth, soft. A time of looking at my circle obsession, creating those circles, making them into something to be seen, traced, pulled, molded, perhaps even stroked. Definitely for touching. Concentric circles, which concertina out as the piece hangs and moves, heavy enough to hold their place as well when folded close against the chest. *Still looking at some finishing touches. so so so so so so clever. it's an architectural feat in fabric if ever there was one. it's almost painful not to be able to run my hand over it! touch it! 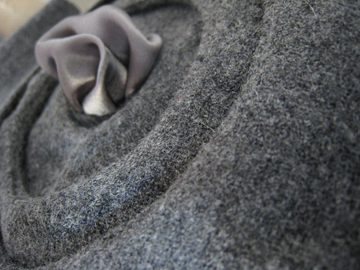 sculpture as clothing, as tactile experience. this is wonderful and fascinating and i wish, very much, that i could touch it.